From the tender age of 5, I walked 1 km (about 2/3 of a mile) home from school for lunch, then back again. In fact, I did this every morning, lunch, then back to school and home after school again, for a total of 4 km’s a day; no matter what the weather conditions. However, at the time, I didn’t realize how lucky I was to get a hot lunch every day. I LOVE a hot lunch and have never been much of a cold sandwich fan, at least not on a daily basis, so I have had to get creative and come up with some sandwich alternatives. 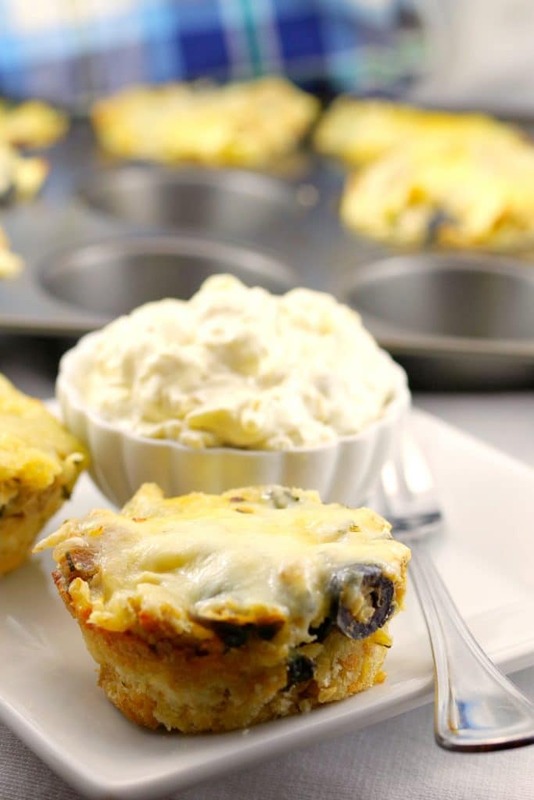 So, if you’re like me and you’re looking for something other than sandwiches, then these Greek Lasagna & Garlic Toast Cups are a great sandwich alternative for you! Since we live 2.3 km’s from the school (out of the walk zone) my kids don’t generally walk to and from school. And they have always stayed for lunch. But I guess that’s a good thing because I’m not at home to make lunch for them like my Mom was for me. But that also means that I need to plan what to send for lunch. And that can be really painful. Today’s communities seem to have less schools and longer distances between schools and the majority of moms are working outside the home. So staying for lunch has become the norm. I don’t buy into the extreme Bento Box crowd stuff, where everything has to be excessively cute and engaging so kids will eat it. Therefore, I need to rely exclusively on deliciousness. Plus, I’m not sure who these people are that actually have time for that nonsense, but I’m definitely not one of them. 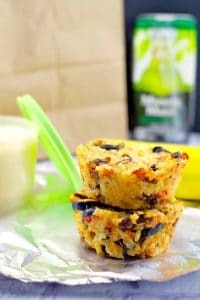 I’m a little crazy about Greek food and I love stuff made in muffin cups. 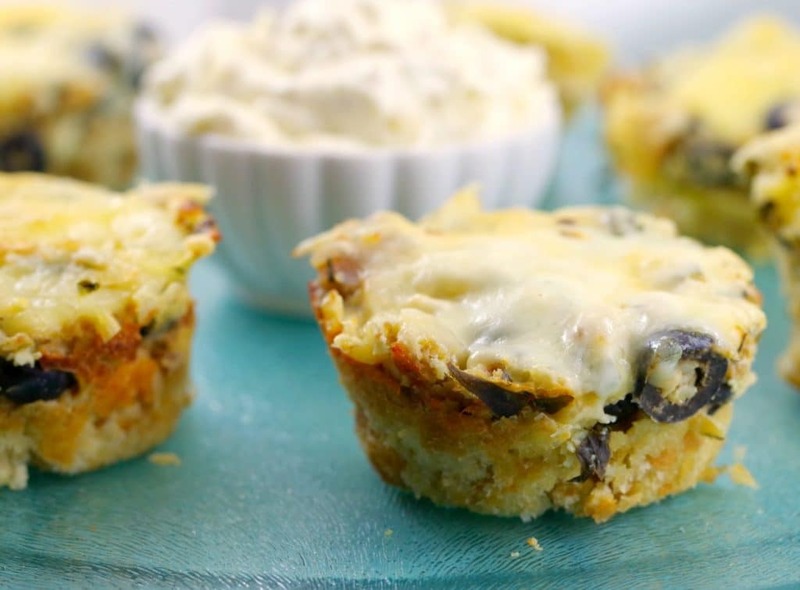 So, these healthy chicken lasagna cups are all that and more! Honestly, this was really an experiment that happened to have a happy ending. I didn’t expect to work, but fortunately for all of us, it did! These also make a great appetizer and are perfect for your potluck! I’d be thrilled if my kids ever got that much exercise in a day, much less every day! And I tell them that more than they care to hear it. When we were kids, we used to make fun of “old people” for going on and on about how far they walked to school when they were kids; miles and miles through the snow, without shoes apparently …. And here I am, pretty much doing the same thing. Well, at least a hot lunch is somewhat of a consolation for having to listen to me. If you are looking for additional sandwich alternatives to bring for lunch, then check these out! 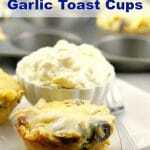 Lasagna & Garlic Toast all in one little cup! 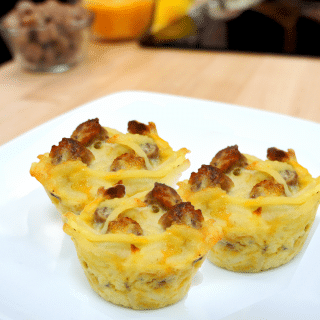 Packed with Mediterranean flavors, ground chicken, lasagna noodles on a garlic toast base, these lasagna cups makes a great lunch bag meal, appetizer or potluck dish. Make ahead, as they freeze really well! 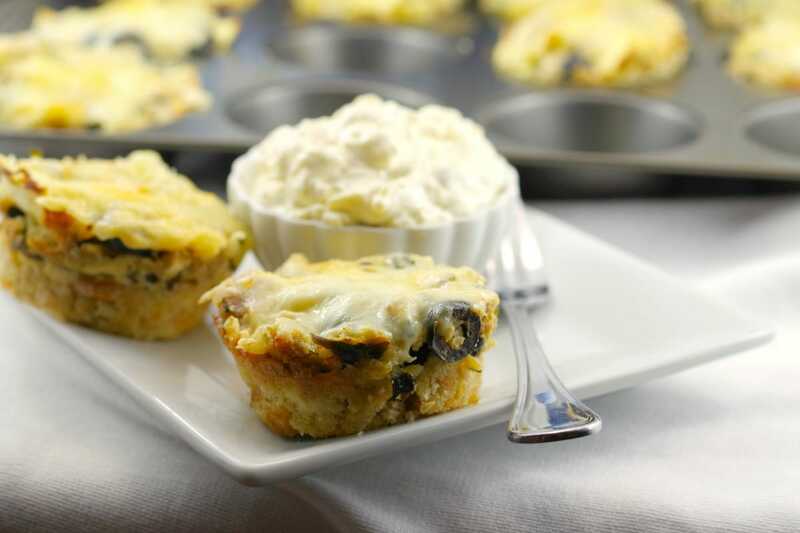 Preheat oven to 350 degrees F. Spray 12 muffin tins generously with non- stick cooking spray. Cook ground chicken on stove top until no longer pink. Process garlic bread to crumbs in food processor. 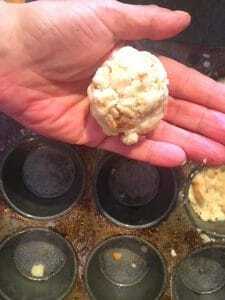 Press garlic bread crumbs into each muffin tin (about 1/4 full) by wetting hands with water, then rolling handful into a ball about the size ping pong ball and pressing into muffin tin. 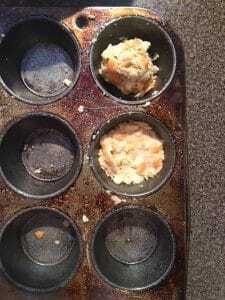 Press until they are very compacted and fill each muffin tin . Chop lasagna sheets into small pieces -about ½ inch squares. Mix lasagna pieces and all remaining ingredients together (except mozzarella cheese) in medium mixing bowl. Add mixture to top of garlic toast crumb base and pack to the top of each muffin tin, compressing with spatula. Cover muffin tin with sheet of tin foil and seal. Cook in preheated oven for 25 minutes. Remove from oven and evenly spread mozzarella cheese on lasagna cups. Return to oven and bake for 5 additional minutes, then turn up oven to broil (500 degrees F) and broil for 1- 2 additional minutes or until cheese is bubbly and garlic and lasagna cups are lightly browned. Let cool on counter for 5 minutes, and then loosen by running a butter knife around the edge of each lasagna cup. Let cool for another 5-10 minutes, run knife around edge again before gently removing with small (mini half) spatula. I LOVE this idea, and for a grown up’s packed lunch. I don’t do sandwiches, either, and in the winter, salads just don’t cut it. These are perfect, and sound delicious. Can’t wait to try. Thanks for sharing, Terri! Colleen – thanks! Yes, we need a nice, hot lunch in the winter for sure. I hope you enjoy them! Wow ! These look mouth watering ! My son will love these much better than a boring sandwich ! Thanks for sharing ! This is an awesome idea Terri! 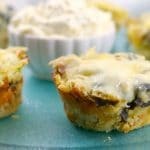 Love make ahead recipes in muffin tins. I usually make egg muffin frittatas, but this lasagna is so creative. Perfect for work lunches or busy weekday suppers! I love little packages like this for meals and a recipe that uses Greek with Italian ingredients is very appealing to me. The littles in our family will love this for their school lunches and their parents will appreciate how convenient they are. Thanks so much for your creativity in this recipe, Terri – it is a must try in my books. Cheers and happy weekend! Hi Denise: Thanks! Yes, Greek and Italian are just so good together! I hope you enjoy them and happy Thanksgiving to you!